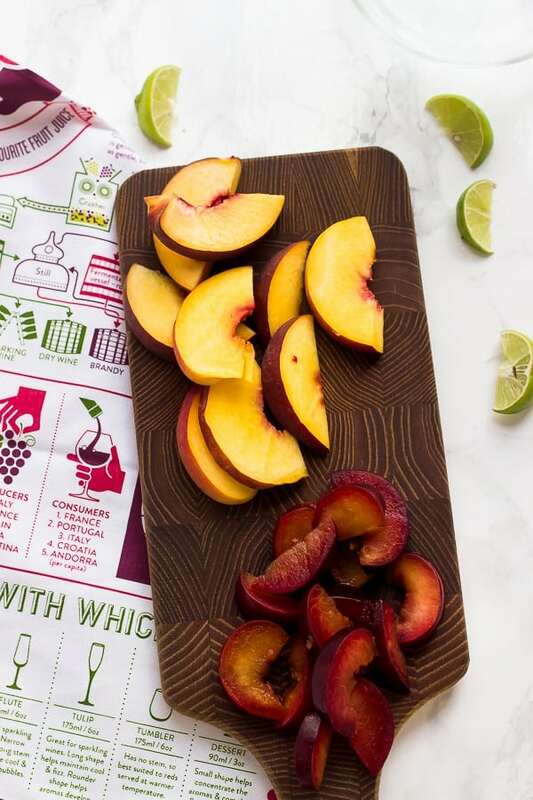 This Stone Fruit Sangria with Peaches and Plums is about to become your new favourite sangria!! Loaded with delicious sweet peaches and plums you can’t stop at one glass! I’m currently on vacation in London! I’ll try to respond to your comments and messages but there may be a delay! This post was originally published in 2016. Happy Sangria Day!! Now, I don’t mean National Sangria Day, that’s December 20, I mean any day you want to make Sangria is a happy day. 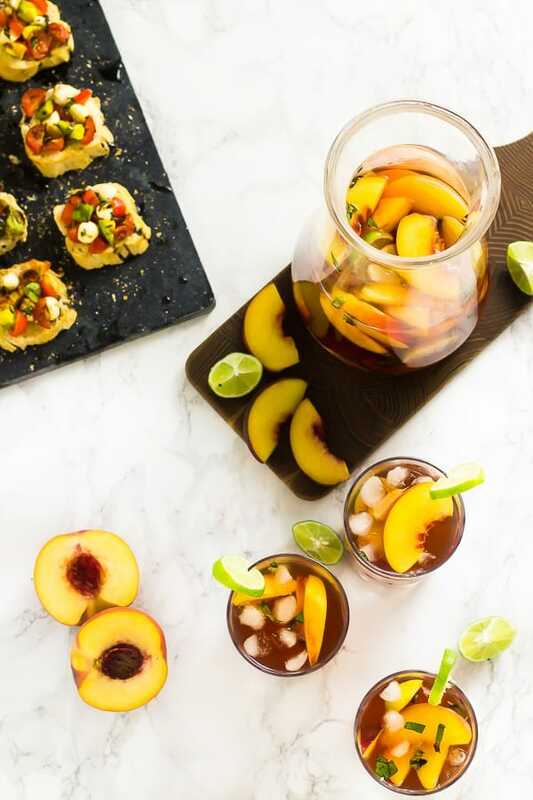 It’s no secret that I love sangria, and so I knew I just had to share this Stone Fruit Sangria recipe with you before summer is over. If you follow me on Snapchat then you got to see me make this from start to scratch. 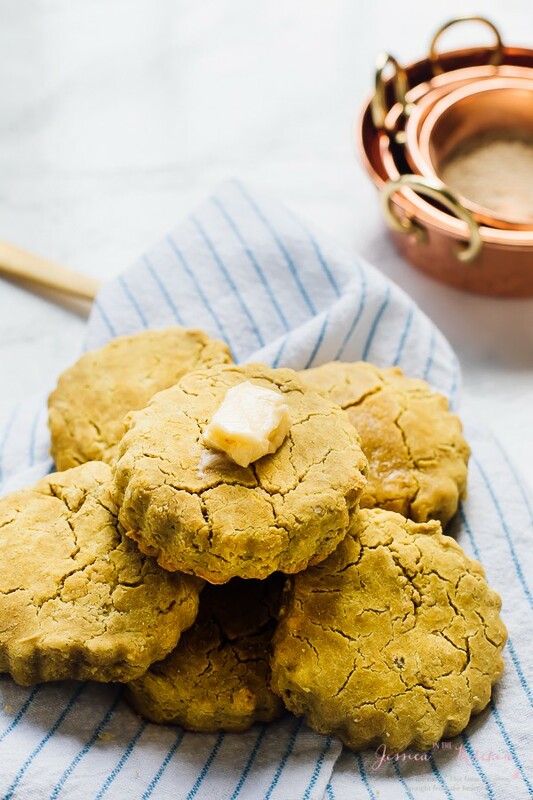 Most importantly, you got to see the amazing kitchen & bar tools from Uncommon Goods that I used to make this delightful treat. This is a fun post friends, since we not only get to share sangria, but some amazing products that I fell in love with. P.S. can you keep a secret? This Sangria is about to rock your world. When Uncommon Goods reached out to me to partner with them, I was beyond thrilled. You see, some people go window shopping in real life, others, aka full time bloggers, tend to window shop endlessly online. I’m kind of obsessed with everything on their website, especially the kitchen & bar section, and that everything is unique & uncommon – completely one of a kind in its nature. You may have noticed that I love unique bowls, cutting boards & dish towels and use these all the time in my posts, but even I was blown away by these options. 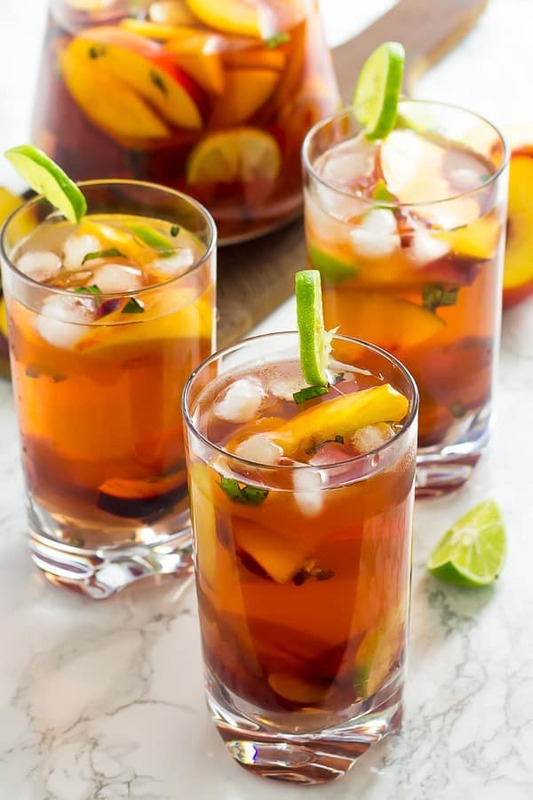 I wanted to highlight some of their products that I was most in love with that I thought would help you to create a beautifully themed summer backyard fiesta/party/sangria gathering for one (I won’t tell), your choice. For starters, I got the Tree Ring Serving Board because, how could I not, it’s absolutely gorgeous, and 100% organic undisturbed tree rings. I also got The Wine Towel because of my obsession with learning about wine and because it’s such a cool conversation piece. Let’s talk Sangria for a bit. This Sangria is so delicious, so fresh with the fruits, and a 100% crowd pleaser. Everyone loved it and it was so easy to make. I just made the natural simple syrup on the stove top, let it cool, then poured all the ingredients into the carafe with the simple syrup and stirred. Voila. 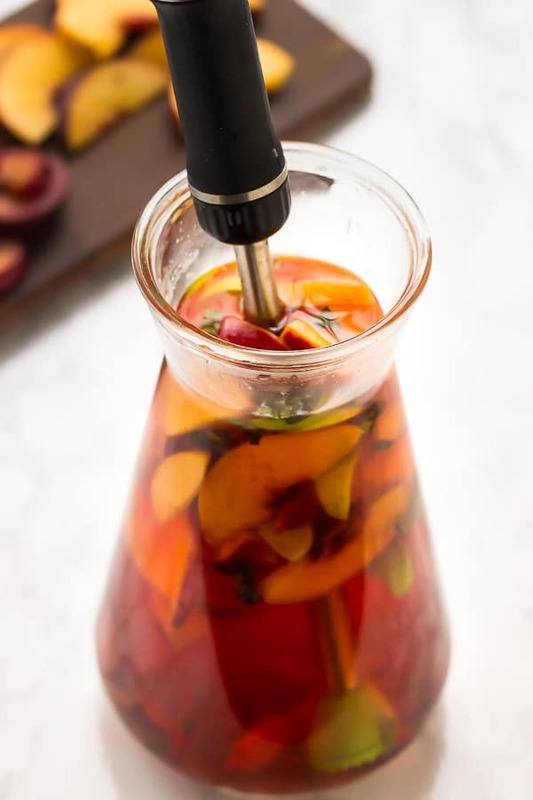 To make this Stone Fruit Sangria, I opted for the zing Flavor Infusing Carafe. Normally you’d use it for infused water (all the rave) but I wanted to show it’s versatility. It comes with it’s own muddler (pictured above) with these helpful groves so batch mojitos just got a whole lot easier. I used it to muddle the plums to infused even more flavour, and it’s also great as a stirrer. Why I loved this was because it looked so stylish & attractive (read: everything I love in a product) it was also SO useful. 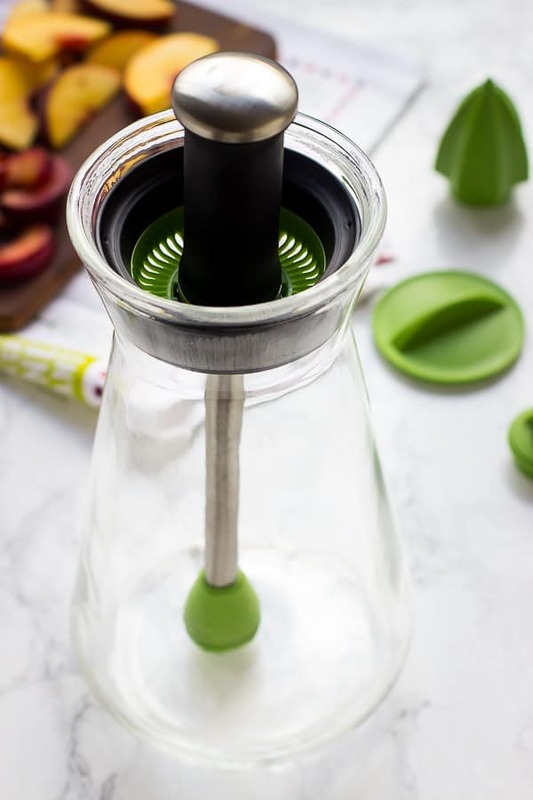 It also comes with toppings for a citrus press and two different covers so you really just have to use one item to make an entire crowd drink. Also, it’s pretty large so the entire sangria fit without overflowing at all. Win, win. To add to the fun, I knew I had to chose the Unbreakable Tumblers to pour the drinks into. You read that right, unbreakable. I may or may not have broken about 3 of our glasses, snapped a spoon by just holding it, and tripped over my own shadow more times than I’m happy to share. True to nature, I almost knocked these glasses while shooting (I’m a real charmer) and I was so, SO glad that they didn’t break. Totally perfect for guests, outdoor parties, and even kids’ parties. They have so much more amazing drinkware over at Uncommon Goods that no doubt I’ll be back for more. You may recognise the platter from my Avocado Caprese Bruschetta post, where I gave you a little teaser. You can cook your food on this soapstone tray in the oven (yes!) then remove it (oven mitts!) and serve it on the stand that comes with it while it keeps everything warm for up to 30 minutes. I totally loved this because it just screams entertainment. It also works cold, so hello cheesecakes for the holidays. I’m looking straight at you. Now that we’ve gone through all of these items, you know you need to head over to Uncommon Goods, right? I guarantee you’ll find something unique that you love for your parties and celebrations or even as a gift. Oh, and make sure you serve the avocado caprese bruschetta with this Stone Fruit Sangria. 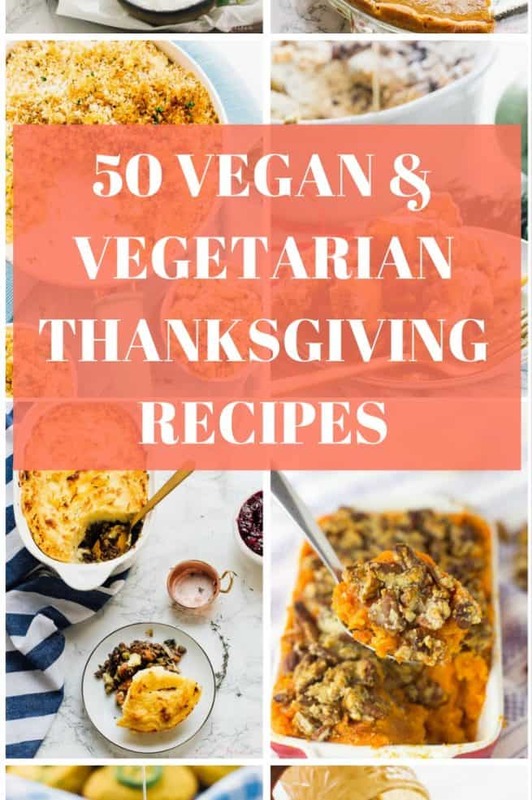 I guarantee they’re a total hit together, but you’ll need to set some aside because once your guests give it a taste, I doubt there’ll be any left for you. This post was sponsored by Uncommon Goods. All opinions are 100% mine. Thanks for supporting brands that help support Jessica in the Kitchen! In a pot over high heat, stir the water and sugar until it comes to a boil. Boil together until they form a simple syrup for about 1 minute. Remove from heat and set aside to cool. In a jug, mix all the other ingredients together. Add the simple syrup and swirl to sweeten the sangria. You can sneak in a sip now, but refrigerate for 4 hours to overnight for the flavours to meld together properly and be smoother. This sangria is calling my name!! 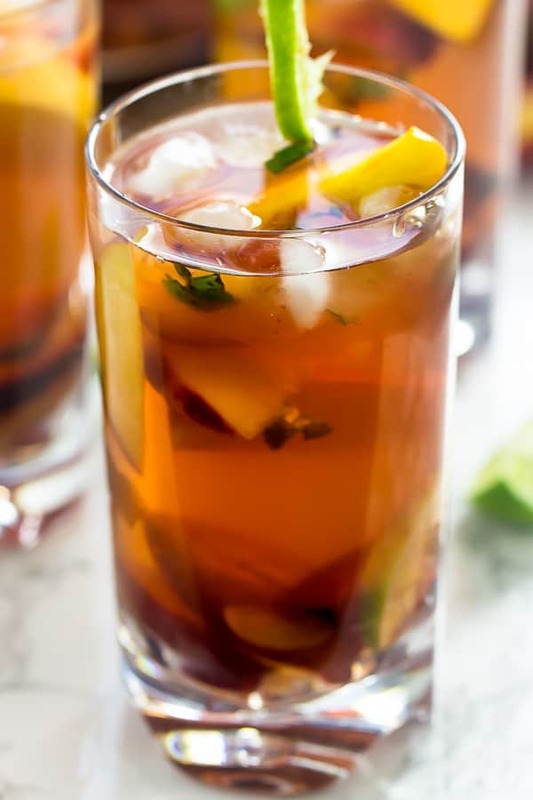 What a wonderful Summer drink! How did you know that this summer I’ve been craving Sangria? Not the boozy sangria served at most restaurants and bars but the fruity made with wine sangria that I remember my father serving. 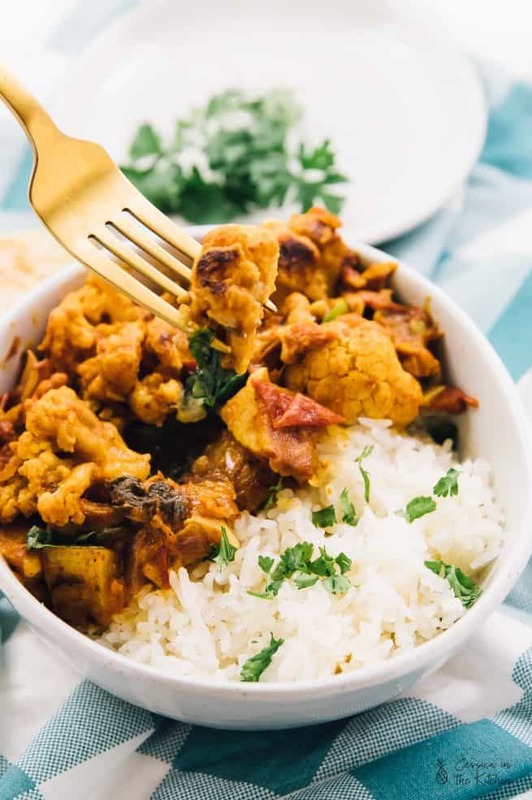 Last weekend I made a virgin version to serve to guests with young children and after they left added white wine to use up some of the leftovers. Thank you! I will definitely try this one.